The ski resort was the dream of ski champion Jean Vuarnet who appreciated the enormous potential for skiing on the slopes of the Chavanette and Hauts Forts massifs. A native of Morzine, Vuarnet had brought international recognition to Rossignol when he won Olympic gold at Squaw valley on a pair of Rossignol Allais 60 wood-metal composite skis. Morzine itself had become a popular winter sports destination in the 1930s. Work started in 1963. Vuarnet built a cable car but had run into money problems so contacted Robert Brémond, a Paris based builder about his ideas for the future of the resort. The Bremond family, originally from the Alsace, had been in construction for 3 generations. Robert's father had built apartments in Strasbourg and Robert had worked for a private public partnership in Paris just after the Second World War before starting his own construction company. Amongst his works, the first skyscraper at la Defense. Robert beleived that the mountains were for the young. He thought the resort would be a good foundation for his son Gérard. He told him "I'll give you a start, you can repay me later". Gérard also thought it would be more fun to build in the mountains than Paris. So with two million Euros (in today's money) in his pocket he established the SAMA (Société d'amenagement des Montagnes d'Avoriaz) and the SICA (Société immobiliere et de construction d'Avoriaz). Brémond assembled a team of three young architects, Jean-Jacques Orzoni, Jean-Marc Roques and Jacques Labro (Prix de Rome). He had recognised Labro's talent when he had worked for his father on the redevelopment of the hill area at St Cloud to the west of Paris. This band of brothers were linked by a love of sking, the mountains, cinema and music. They were overflowing with ideas for the site. Brémond remembers that everyone involved with the development of ski resorts in the 60s was unrealistic, otherwise they would never have started. He was known as an excellent manager. The big clunking fist inside a velvet glove. Brémond believed that a ski resort should be different from an urban center, it should offer the chance to relax, a change of air, the freedom to dream. How could you have a holiday in a housing project surrounded by traffic? 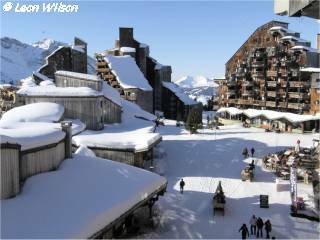 From the outset Avoriaz put a particular accent on the protection of the environment. Cars had to park at the entrance to town. Tourists would get around on foot, skis or on horse drawn sledges. The architecture that dominated French ski resorts at the end of the 50s consisted of blockhouses at best covered with a bit of wood. This was a time before France had designated its first national park. Man was expected to dominate nature. Brémond's team were more humble, they wanted the site to blend in with the mountain, no sharp angles, buildings covered in natural rot-proof Canadian red cedar shingles. The bankers and public financiers didn't get it, they refused to lend money to further develop the resort. When Maurice Michaud, the so called Snow Dictator and otherwise the head of the French Government's CIAM (Commission interministerielle pour l'amenagement de la montagne), didn't mince his words. He called the first building a carbuncle and said that the resort was situated at the back-end of beyond, the ski area wasn't worth the candle and the proposed link with Switzerland would never happen. He described Brémond's team as a bunch of jokers. In President Pompidou's great car owning democracy the idea of a ski resort without cars was completely alien to him. To kick start the development Gérard Brémond had a novel idea. He would sell the properties from plan. A bold move in a resort that had a couple of buildings and a few ski lifts. Using his contacts he invited the movers and shakers from Paris to Morzine where he took them on the cable car to the almost virgin plateau. The hotel Dromonts, with Labro's splendid interior architecture, opened for Christmas 1966 and the resort was born. Bremond continued to use his show-biz connections and the resort rapidly became known as St Tropez des Neiges. It was the preferred destination for Brigitte Bardot and other French stars. Slowly but surely the cachet of the site began to rise and with it the price of property. In 1973 Lionel Chouchan and Brémond started the Fantasy Film festival with the premiere of Spielberg's Duel. The resort still had problems with financial stability. Outside of the main holiday periods it was virtually empty. Brémond came up with the idea of selling apartments on lease back. Owners would use them for set periods but the rest of the time, rather than stand empty, they were let by an agency to other tourists. An idea that would make Brémond's fortune in the form of Pierre et Vacances, launched in 1978 and linked closely with Avoriaz. P&V extended the concept to other resorts and to beach holidays. The money earned finally enabled Avoriaz to clear its debts including the money lent by his father. P&V sold its interest in the SAMA to Sofival, who run the lifts at Val d'Isere, in 2001 and the group may soon fall into the hands of the http://pistehors.com/backcountry/wiki/Bio/Compagnie des Alpes.